This ebook presents a detailed discussion in support of vegetarianism and animal welfare. Geshe Soepa's presentation begins with an extensive look at the various sutras and tantras which reveal the Buddha's teachings on why we should avoid eating meat. There is a question and answer section on topics including tantric rituals and whether to offer meat to Sangha. Geshe Soepa also discusses the practice of neutering animals and concludes that eating meat or otherwise exploiting animals is contrary to the core Buddhist practice of compassion. His Holiness the Fourteenth Dalai Lama, Tenzin Gyatso, has read through Geshe Soepa's explanation and said "It is well written. It would be nice if more equally useful texts were written for people to read." 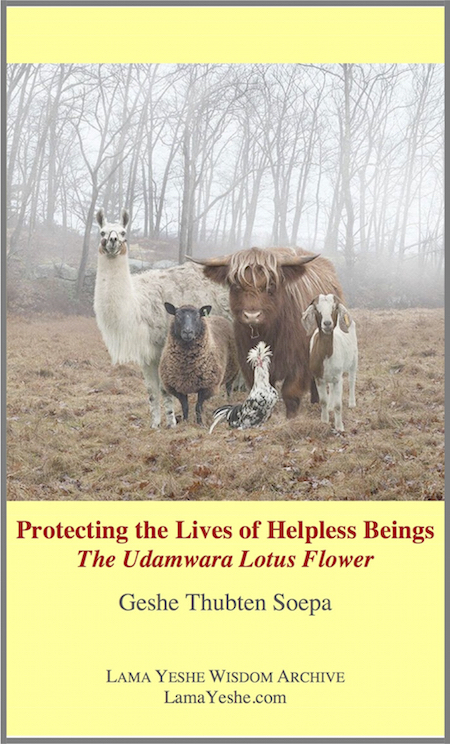 Protecting the Lives of Helpless Beings is a must-read for all Buddhists and especially for those who wish to support and advocate for vegetarianism. A proponent of animal welfare, Geshe Thubten Soepa has taught extensively on the subject of vegetarianism. Order a copy from your favorite ebook vendor using the links below or download a PDF file. LYWA Members can download the ebook for free from the Members Area. You can read this book and more teachings from Geshe Soepa on our companion website TeachingsFromTibet.com.